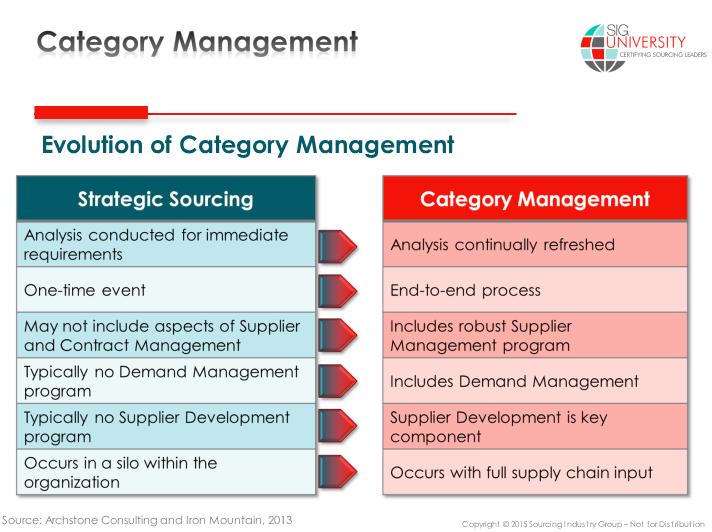 With the evolution of procurement and the shift from a reactive, “three-bid-and-buy” scenario to more advanced means of sourcing, Category Management often is a concept best placed at the latter end of the spectrum. This makes sense because if you still quote products and services on an as-needed basis, you likely haven’t introduced the concept of collectively sourcing all spend within the category or subcategory. That reactionary approach may be the result of several things -- lack of support from the business, a misunderstanding of Procurement’s role, an inadequate process or workflow, or a combination of all of the above. On the other side, many organizations have Category Management structures in place, or at least claim to. From my experience, an organization saying it has a framework for Category Management and an organization actually having such a framework are two very different things. More often than not, organizations will either employ a homegrown version of the methodology or leverage something that’s really not like Category Management at all. Category Management can be approached differently based on several factors, including the industry you are in, whether you are service or product focused, what model of procurement you apply (centralized, decentralized, or center led), what drives the most spend in the organization and so on. As a result, I don’t think there is a strict rulebook on how to apply Category Management to your business. While no two organizations will approach Category Management the same, these best practices should help any organization ensure their unique methodology is effective.